I just came across this very nifty idea and had to share. 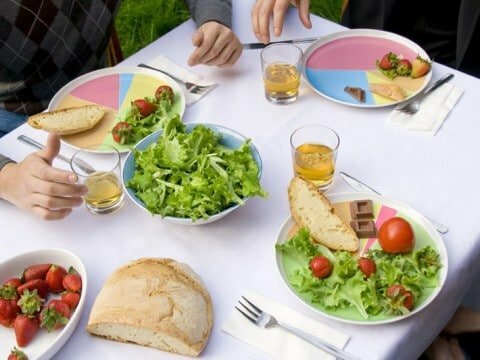 The Wheel of Nutrition plate, designed by Hafsteinn Juliusson, Rui Pereira and Joana Pais, should help give you a better idea of how much of each kind of food to put on your plate. Obviously it’s not über-scientific, and it seems to be just a concept at this point, but I think it gets the point across nicely. Apparently the Wheel of Nutrition Plate is no longer being sold. However, you might like The Portion Plate on Amazon.